Use this topic if you’re an AffiniPay partner with customers who are AffiniPay merchants. 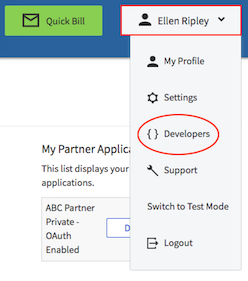 Otherwise, see the Quickstart to decide how to connect based on your integration type. Request gateway credentials so you can perform transactions on behalf of that merchant. Note: Before you begin, see the best practices for AffiniPay partners. client_secret is the OAuth Secret from your partner OAuth application. You can access merchant account details after you receive an access token. 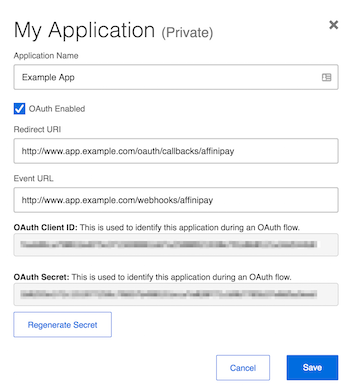 Your OAuth access token allows your application to make calls to the Authentication API at https://secure.affinipay.com/api/v1/. The AffiniPay Payment Gateway API, however, requires separate credentials for access. To request credentials to access the AffiniPay Payment Gateway API, send a GET request to the https://api.affinipay.com/gateway-credentials endpoint using your access_token. "reference_label": "New Reference Label Name"
This API returns a list of the test and live accounts associated with the authenticated user’s merchant account. Included in this information are the keys you’ll use to make calls to the AffiniPay Payment Gateway API. Save these credentials securely so your application can manage transactions on behalf of this merchant.